GameGeex - [UPDATED] 18 things you should know about Minecraft 1.8 Mojang is fixin' to release their latest patch for Minecraft, and here's what you need to know. Patch 1.8 is coming to Minecraft, and with it a bevvy of additions that promise to change the game as we know it forever. Where the focus previously has been on building, Patch 1.8 will bring a lot more realism and persistent world elements to Minecraft. But what is really worth knowing about the Adventure Update? We've done the research so you don't have to, and have wrapped it up in a neat little countdown so you can see all the most important bits in one place. Find our Top 18 List for Patch 1.8 (18, get it? See what I did there?) list after the jump. Update: The #1 spot in our article was reserved for the release date of the patch. I realize that the Adventure Update was pushed back as a result of bugs found by the modding community, but until we get a clearer set of information on that, I'll leave it as is. 18. 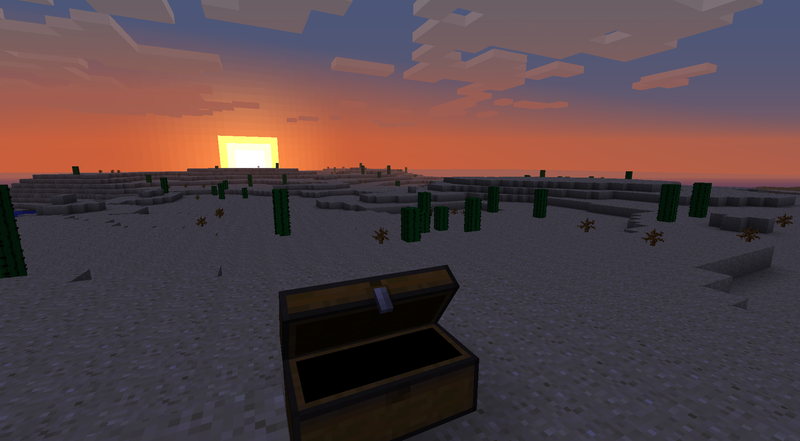 Chests now have opening graphics: According to an image Notch put up on Twitter, chests will receive a new open graphic in Patch 1.8. Whether this means an opening animation will be added (A la Legend of Zelda) we will have to see. 17. Zombies now drop Rotten Flesh: The announcement came through the Mojang Youtube channel, and it's a strange one. We see the item drop in the patch trailer above, but no one is exactly sure what you use Rotten Flesh for. Maybe lamp shades? 16. Glass panes and 9 more block recipes available: We've been seeing the glass panes for a while now, but only recently have we heard about the Spike Blocks, which hopefully have a destrictive capability for use in contraptions. Minecraft Wiki is talking about 9 block recipes that will now be available, including Brick Stairs and Fence Gates. At least Mandifesto Mansion will now how have realistic-looking windows, so there's that. 15. Multiplayer UI redone: The multiplayer screen now includes a server list and a search system that will let you find servers to play on. In addition there is a player list for each server so you know how many people are on at any one time. This is huge as far as I'm concerned, considering that I play on multiple servers and have had to keep track of them with a Sticky Note on my desktop. 14. Modding support: Those of us who use things like CraftBukkit will be happy to know that modding support is coming in Patch 1.8. What this will entail is still largely unknown, but it's nice to know that modders will at least get some tools to help them out. 13. Gorges, Canyons, and Ravines added to the game: We're now going to have to watch where we step when we go adventuring, as ravines are going to be slicing up the landscape in Patch 1.8. There are above-ground and below ground versions of these canyon systems, and they should provide with some unique exploration experiences. And deaths. Lots of deaths. 12. Farming system now updated: For players like me this is probably the most important change in the entire patch. Farming will be "more interesting" they say, but we're not exactly sure what that means. There will be plantable Pumpkin and Melon seeds, which will grow into vine-attached plants for use in food. In addition we will be able to get our animal husbandry on with the new animal breeding system. What I'm unclear about is what this means for real world animal scarcity. Looks like I need to build myself a chicken farm. 11. Sprinting added to the game: The ability to run faster in short bursts is now in the game, and with it comes some interesting knockback mechanics. Long jumps are possible after sprinting, and you can run into mobs and send them flying. I anticipate much hilarity and shenanigans. 10. Rivers with water flow mechanics: Generated on server start, rivers are now introduced to the game, and are said to have at least a cursory level of water current within them. I look forward to seeing if you can create your own streams and have them behave in the same manner. 9. Seven new biomes now in the game: Amongst the announced biomes now in Patch 1.8 are the Mushroom biome (sounds oddly familiar), the Mountain biome, and the Swamp biome. Biomes themselves are said to be more distinct and large. 8. NPC villages added to the game: Randomly generated, these hubs of domestic life will be the center of your world now in Minecraft. You will be able to buy a plot of land within the villages to build your own home on, and interact with NPCs in a limited fashion. Some sources list that the NPC village will contain a Well, which may hint to the fix of the unlimited water bug previously in the game. An NPC Blacksmith will allow you access to a lava-powered forge for all your smelting needs. 7. Strongholds/Ruins added for exploration: Randomly generated dungeons have been added to the game in Patch 1.8. These areas are built with a combination of Stone Blocks, Moss Stone Blocks, and what looks like Iron Bars or gates. Mojang lists the Strongholds as underground areas for exploration, and the aboveground versions have been called Ruins. Whether they are vastly different from eachother remains to be seen. 6. New combat mechanics: It's the Adventure Update after all, so in addition to the experience system, combat will now include critical hits. Bows are now drawn more realistically, and the arrows will actually stick in mobs (hopefully for retrieval afteward). At least one source has indicated that we will also be able to block attacks. Shame this doesn't mean we get shields to protect ourselves with. 5. Creation mode, now with flying: For those of us who just like to build, there is now a mode that will enable you to switch over to the unlimited block set and build what you like. There are limited flying abilities with this mode so that you can enjoy your creations from above much like Little Big Planet. 4. New monsters added to the game: We've mentioned the Endermen before, and there's an interesting interview over on Machinima that's worth a watch. Now we've learned that there are two other mobs coming to make your nights into nightmares. First is the Silverfish, a mob that lives inside blocks and will jump out and attack you, though rarely. The second is a blue Cave Spider -- as if we didn't have enough spiders in our Minecraft lives as it is. 3. Food system now in the game: Food is handled differently in Patch 1.8. While you used to be able to get healed directly from eating, now you have to chew your food like a good boy in order to get any benefit from it. Additionally a food meter has been added to the UI which will slowly ticks down depending on how much energy you expend by activities. If you get below 10% you might even starve, which would be intriguing. Food will be stackable after Patch 1.8 New foods are being added to the game including Raw Chicken, Cooked Chicken, Raw Beef, Cooked Beef, Melon and Melon Slices, so at least we'll have something new to chew on as we try to stave off starvation. 2. Experience added to the game: Experience orbs are now dropping from mobs, but the actual experience points won't be used until Patch 1.9. 1. Adventure Update coming 9/8: Jeb let us know via Reddit that we should see Patch 1.8 as early as Thursday. Man, that's a lot of changes. Silly me, when I started this post I thought I would have a tough time coming up with 18 new things. By the end of it I had cut out a few -- I never even got to the pig noses. There's so much coming it's going to feel weird playing the game before the patch lands Thursday. Weird, but that's not going to stop me mind you. Im so eager to try this out, my spleen aches.